Among the many and varied personal adornments, rings are unique, and no other piece of jewelry carries so many different symbolisms. Rings can be enjoyed purely for themselves, as just works of art, and objects of beauty, but they can have their own fascination simply from the many meanings they can have attached to them. 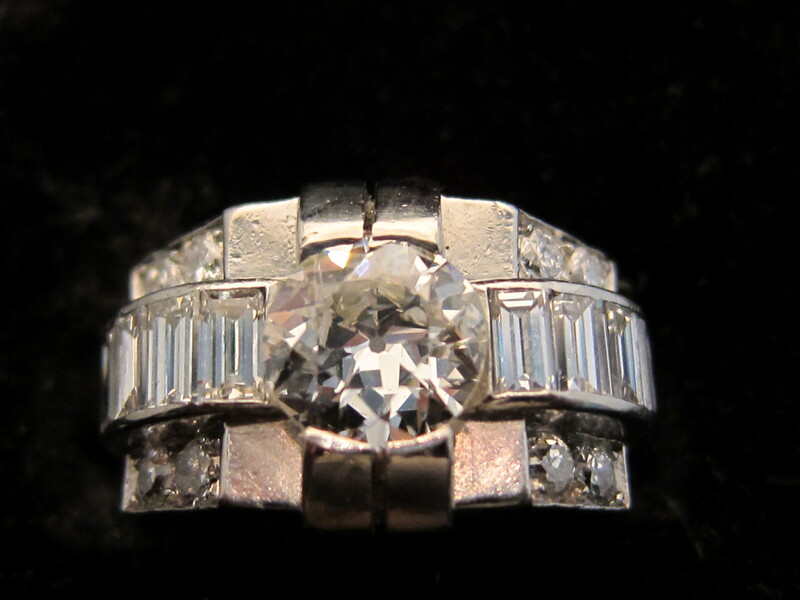 Engagement rings have been used by couples to symbolize their love, and pledge their fidelity to one another. Kings and Popes have used them to proclaim their strength and power. The aristocracy to display their family lineage; merchants to mark their goods; and rings have been used for commemoration of those who have passed on. Infinitely precious, yet so often understated and unobtrusive, personal and enigmatic, rings speak to us in a language that is timeless. In this blog, we are going to look specifically at the dress rings from the Art Deco period, known as “dress rings”. 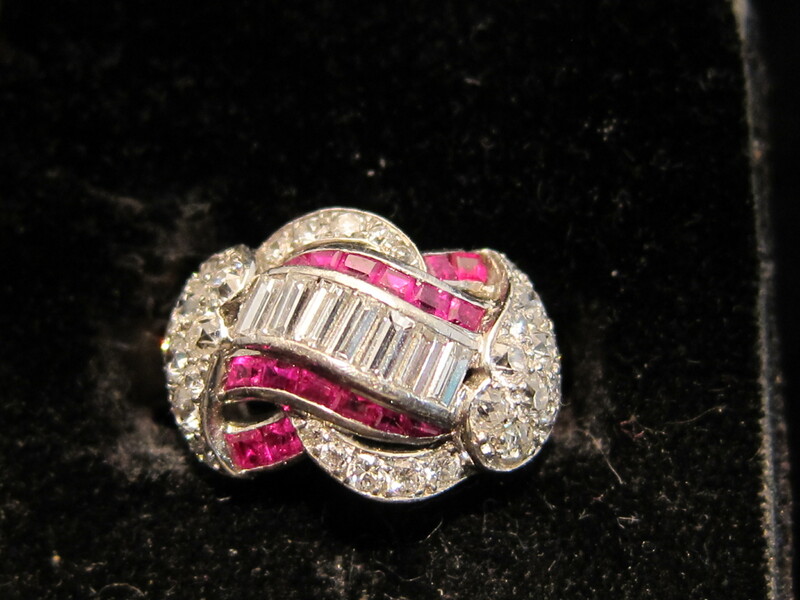 Dress rings from this time period were radically different; the 1920s and 30s were very ostentatious decades, and this can be seen in the types of dress rings that were fashionable. 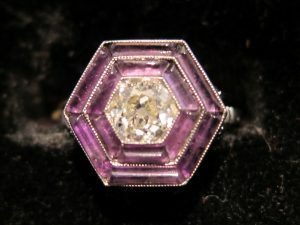 In the early 1920's -- the onset of the Art Deco period -- dress rings became not only physically huge, but also displayed daring color contrasts, and used a lot of different stone cuts in geometric patterns -- triangles hexagons and trapezoids -- all characteristics that contributed to the dress ring breaking away from the traditional style of rings. These dress rings took these new cuts, and surrounded them with Calibre-cut colored gemstones, or by tiny round brilliant cut diamonds, or by long baguette cut gemstones, which were all used in dress rings during this time period. 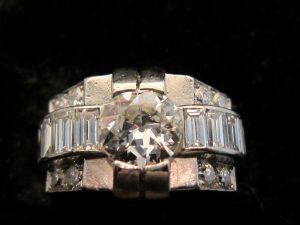 Previously, it had been the fashion to wear a ring on virtually every finger, but now with the much larger design of the dress ring, ladies would wear their engagement ring and wedding band on their left hand, and it was considered very chic to just wear one 'statement' dress ring on the right hand. This early Art Deco period, unlike the Art Nouveau period which preceded it, changed the style of dress rings from nature motifs to those of the machine age and modern industry. 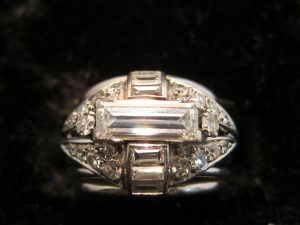 In the 1930s, the latter part of the Art Deco period, dress rings became even more dramatized, and geometric outlines were further exaggerated. There were many alternatives to expensive solitaire diamond and valuable gemstone dress rings. 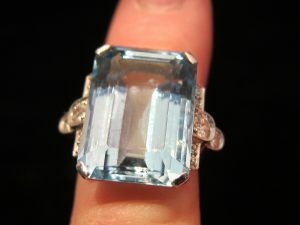 Citrines, aquamarines, amethysts, and Topazes were all mounted in simple platinum dress rings mounts. 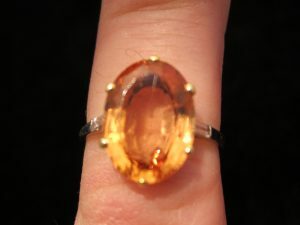 Also, the chunky dress ring with huge slabs of stone was not just limited to the ladies; many men also wore these ostentatious dress rings, as they particularly suited the fashionable menswear of this period.